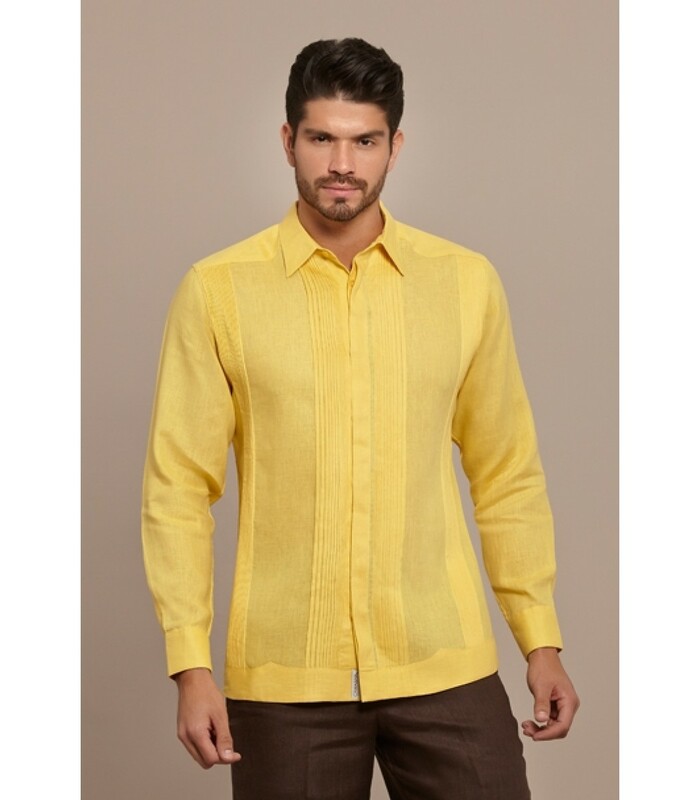 Yellow Pleated Linen Guayabera, size 40. "Those who acquire Camasha clothing help and value the art of handmade products. Camasha was created to satisfy the need for original, classy and fine clothing for beach and garden weddings. 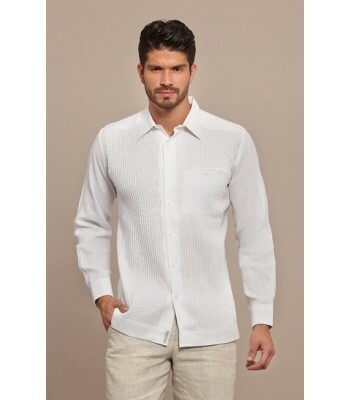 At first, they started by making guayabera shirts only, and due the positive acceptance of such product, they created a more casual clothing line focused on comfort, elegance and freshness, which became a stylish daily fashion. Since its creation, Camasha’s objective is been to help communities from different ethnicities that have a high sense of art during textile manufacturing by encouraging constant well paid work, respecting and recognizing their traditions, which are the base of the culture of the nations. As part of its Social Responsibility, Camasha is always looking for communities that wish to show their art to the world, by sharing the meaning of their work combined with the high quality of their workmanship that distinguishes them. Camasha’s Guayaberas are ideal for weddings, garden or beach events. They will make you feel comfortable and at the same time they will make you look elegant. That is the reason why the guayabera shirts have become a trend and currently, are considered as a synonym of style and formality. All clothing is made of imported Italian linen and premium quality cotton. Likewise, the manufacturing and distinctive details of these clothing are made by Mexican artisans working in the State of Chiapas and Merida in Yucatan. This is a formal hidden breasted Guayabera shirt in yellow, with stylized handmade pintucks, and buttonhole for cufflinks and 100% linen. Camasha was created about 12 years ago to satisfy the need for original, classy and comfortable clothing for men and women who are detail oriented. All their products are handmade from natural materials, always satisfying the taste of the most sophisticated customers. They have also developed a sophisticated line for beach and garden weddings that includes clothing for men, women and children. Their main product are guayabera shirts and they have developed many designs and colors having one of the best selections in the market. The manufacturing and distinctive details of their clothing are made by Mexican artisans working in the State of Chiapas and Merida in Yucatan. 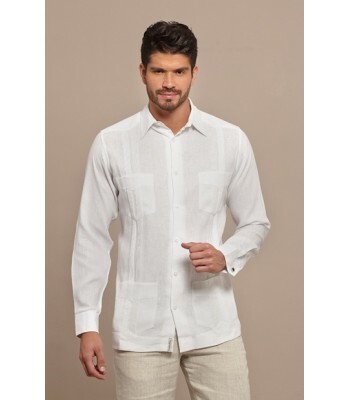 White Pleated Linen "Presidential" Guayabera, size 42. 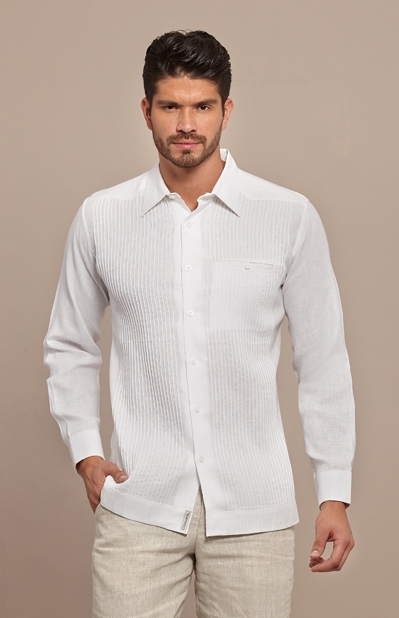 White Pleated Linen "Traditional" Guayabera, size 40. 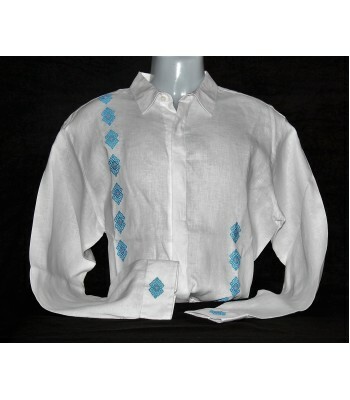 White Linen Shirt with Artisanal Embroidery in Blue, size 40. 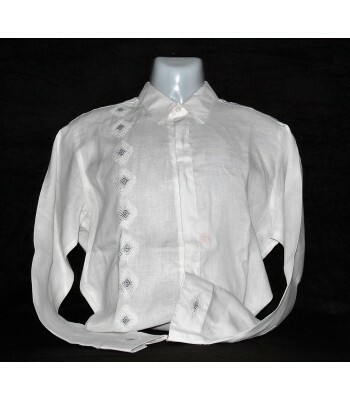 White Linen Shirt with Artisanal Embroidery in Gray, size 42.